KAREN’S KILLER BOOK BENCH **DOUBLE FEATURE** Welcome to Karen’s Killer Book Bench where readers can discover talented new authors and take a peek inside their wonderful books. This is not an age-filtered site so all book peeks are PG-13 or better. Come back and visit often. Happy reading! “Nor will I,” Grandmother said in a deceptively pleasant tone. Obviously she too knew what this was about. “I believe I prefer to stay,” Spencer said mildly. “For the first time?” Cam said slowly. “Don’t you think you should have?” Simon asked. “The rest of us have,” Thad added. “And I have read most of them as well,” Grandmother said. “I don’t think it’s any worse than any other paper, Father,” Spencer said. “Then perhaps you would do well not to read it again,” Cam said in as calm a manner as he could muster. “Thank you, dear,” the dowager said in a wry tone. “I thought we were real people,” Grace murmured. Cam stared in surprise. This was a story he had never heard before, and judging from the looks on the faces of his siblings, neither had they. “They do say certain talents are known to skip a generation, dear,” Mother said pleasantly. “Regardless, I had no need for a muse.” Father snorted. “Which explains a great deal,” Grandmother said under her breath. 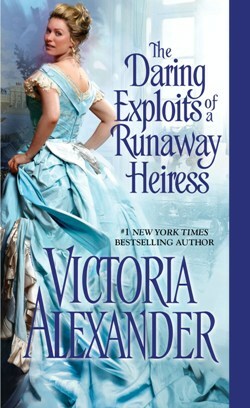 Links to Victoria’s website, blog, books, etc. Thank you so much for hosting THE DARING EXPLOITS today! Good morning, Victoria, and welcome to Karen’s Killer Book Bench! It’s wonderful to have you visit with us today. I love your books and you have your own Keeper Shelf. 🙂 Cannot wait to read this one!